Lori Monson is a native of Minnesota. The natural beauty of its bluffs along the Mississippi River inspire her spirit and her art. An avid hiker and photographer, she integrates the colors and textures she encounters into her designs to create natural, beautiful, flowing garments. The garments and scarves are dye painted silk. 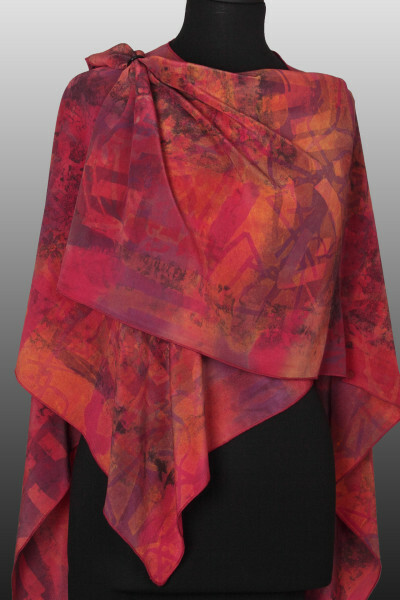 The surface design is composed by layering dye using immersion, discharging, shibori, silk screening, and stamping. Painted cloth is constructed into one of a kind clothing. “Just as we move to the rhythms of life, rhythms of line and color compose the textile surface.” Art is from the soul. I strive to put that soul and emotion on textile surfaces which I hope transcends to a visual delight and art to wear.